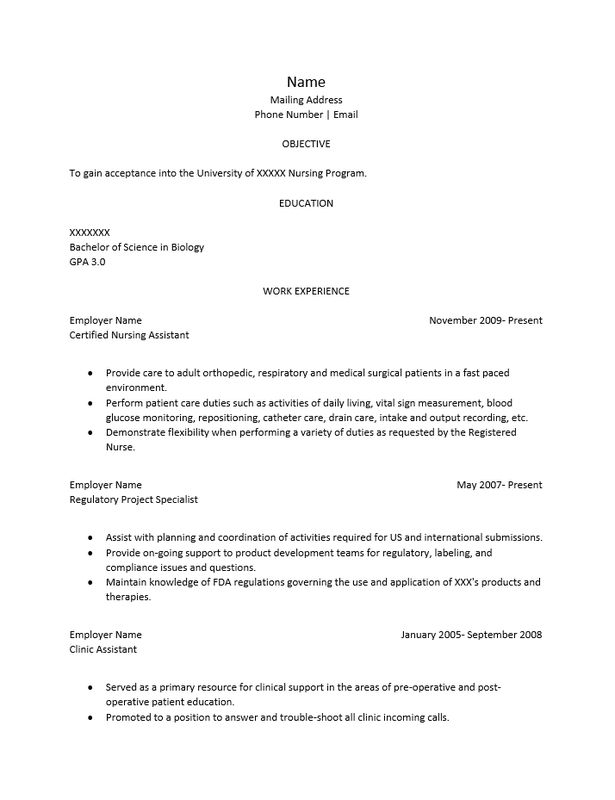 The Nursing School Resume Template may be used when one applies to nursing school. 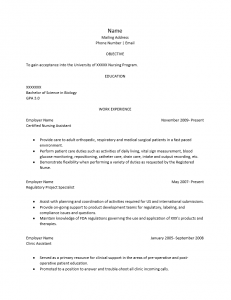 This is a required document when applying for a nursing program and must accompany an application. It may seem daunting to write as one must impress upon an Admissions Department that he or she have met the qualifications necessary for such programs however, by organizing one’s records and credentials properly on a resume the goal of being considered a viable candidate may be achieved. Aspiring nursing students would do well to remember, that admission officers don’t expect them to have too much nursing experience, though anything that may qualify as such is a big bonus. That is, it is generally understood the experience section may not be filled with nursing or nursing related positions however if one can apply any of their experience to nursing, it would be considered an impressive entry nonetheless (i.e. relating a teaching position to the ability to control stressful situations). This demonstrates the importance of content when it is time to fill out the template. As long as a job seeker organizes their thoughts, writes high quality content, and uses the template’s format to his or her advantage then an impressive resume is relatively easy to compose. This will likely go a long way, when coupled with the appropriate submission materials, in gaining one entrance to the nursing school of their choice. Step 1. Your full name must go on the first line of the resume. It should be very noticeable and it is generally expected to be in a larger font than the rest of the resume. The next few lines should be your mailing address, phone number, and email. Step 2. The first section will be titled “Objective.” Here a candidate should write one to three statements regarding their desire to obtain admittance to the nursing program of choice. Step 3. The “Education” section will be where one gives his or her academic history. Specifics such as where this was gained, the type of degree earned, and any supporting information that may be impressive. Step 4. The heading labeled “Work Experience” is where a candidate must report their employment history. Each entry should specifically state the name of the employer, the dates employed, the official job title held, and finally a brief description of their time there. It is highly recommended to keep this in a descending chronological format. Step 5. The final section, “Licensure and Certification” may be an impressive section to include especially when such credentials are required by a nursing school.